all types of antique clocks and barometers since the 1980's. when life was slower...and simpler". 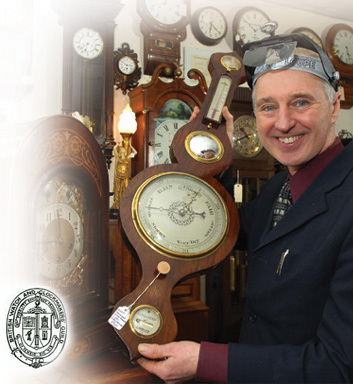 David is qualified scientifically to MRSC MIScT and we are members of the B.W & C.M.G, so you can be sure that your antique clocks or barometers will go to no better workshop. Clocks do not travel well, so you won’t find us at fairs or at auction sites. If you are interested in antique clocks or barometers please browse the website OR you can see and hear them first at our shop.